Turkey’s cities pulse with energy and urban flair. The country is vibrant, modern and, yes, the economy is enjoying an unprecedented growth spurt. To first-time visitors, the country delivers such wow! value that it is hard to contrast this with the ‘other’ Turkey - migratory people who rely on agriculture for their livelihood. Proud and resilient nomads produce some of Turkey’s most distinctive, delicious cheeses. No gleaming stainless steel tanks and high technology centrifuge machines here. Turkey’s nomads, although dwindling in numbers, trek the timeless pathways to high, fertile plateaus in summer and, when winter encroaches, trail their flocks down to sea level. Theirs is a hard life with no amenities and only family, animals and mountains (and the occasional bear) for company. Nowhere does terroir, or indigenous geographical characteristics, contribute so much to the flavor, texture and the over-all merit of a cheese. These kind of traditional, hand crafted cheeses are lovingly known as Mother Earth cheeses that evolved directly from the cradle of civilization and the part of Asia Minor that was once known as the Fertile Crescent. Turkey once had thousands of remote forest villages and rural hamlets and more people were engaged in agriculture than lived in cities. Subsistence farming was practised extensively and was a means of survival. There were relatively few large scale industrial food producers. Nomads numbered in the thousands and shepherded their flocks of goats and sheep to high mountain pastures to graze on the succulent grasses and herbs. Women played a crucial role. In fact, this was a family enterprise and everybody had to participate. The yoghurt and cheeses produced and sold were the family’s meal ticket until the next seasonal cycle of animal births, migration, milking and cheese making. The job of milking goats or sheep usually falls to women. A productive goat will give two to three litres of milk daily. Herds of 300 or 400 goats are not uncommon and create some sort of economy to scale. Modern agriculture with its emphasis on single high yield crops that require fertilisers and pesticides has recklessly reduced Nature’s dominant diversity and resistance to plant diseases. The number of crops that once nurtured different animals at high altitudes has been hugely depleted. Where sheep once grazed, only more robust goats can exist on meagre grasses, roots and pithy conifers. Goats are usually born in February or March and the herd migrates to the high plateaus, or yayla, to spend the summer at altitudes anywhere from 2,000 metres to 2,500 metres. The air is thin at this height and oxygen scarce. The sun can be scorching and the nights freezing. Families usually live in one-room stone dwellings with only a fire for cooking and heating. There is no running water but the local municipality, mindful of votes, takes care to keep water tanks topped up for high altitude families to share. Living in remote enclaves means that the arrival of visitors is a special event and the hospitality quotient is turned up. Expect to spend the whole day visiting isolated families because scores of other families en route will invite you in for tea, news and gossip as you wend your way to the highest plateaus of civilization. The milk gathered from the animals is brought to boiling point and kept at 63 to 65 degrees Celsius for about thirty minutes; or can be kept at 78 to 80 degrees Celsius for one minute for pasteurization to occur. The tricky bit is when to add the rennet that sets off the separation of the curds and whey. Once animal rennet (usually stomach lining) was used but has been replaced by vegetable-based commercial rennet. The addition of rennet is customarily the domain of the senior matriarch of the family. In turn, she will pass on her innate knowledge of exactly when to make the addition to her daughter or daughter-in-law. 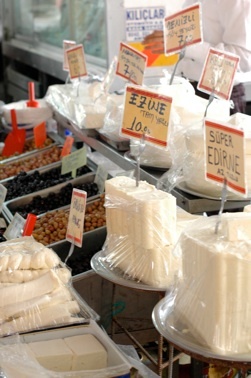 The curds are set to drain in a muslin bag and as much liquid as possible is squeezed out before being pressed into an animal hair casing, usually a cow or goat skin, known as a tulum. Nowadays one rarely sees this in Turkish farmers’ markets: less traditional and much tackier polythene is used. It is important that air not be trapped anywhere as the cheese is pressed into the sack. If this happens, however, it can result in a delicious blue cheese, as the penicillin mold forms naturally in veins. Salt is added to the cheese for taste and to help preserve it. Generally, if cheese is cut from the middle of the casing, it will be less salty. By the end of September the evening chill signals that it is time for families and flocks to trek down again to sea level. Lately this means coming back to a modern apartment with satellite television, washing machine and all the urban trappings. It is hardly surprising that modern shepherds are hard pressed to find a compatible bride who will sacrifice comfort and modernity for the rigors of rural migration! In fact, fewer people migrate every year and shepherds number only in the hundreds these days. With them the artisanal way of making cheese is on the wane. As less and less cheese is produced, it has also become harder to find unless one goes to the smaller hamlets and isolated satellite villages where cheese production still forms part of the indigenous way of life and livelihood. **Although Turkey has dawdled on Euro entry procedures of late, the last successful chapter completed for the European Union was on food hygiene. This article along with photographs of nomadic people (top right and top left) were contributed by Suzanne Swan and are under copyright protection. 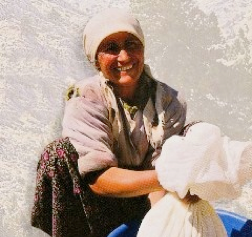 “Proud and resilient nomads produce some of Turkey’s most distinctive, delicious cheeses. No gleaming stainless steel tanks and high technology centrifuge machines here. Turkey’s nomads, although dwindling in numbers, trek the timeless pathways to high, fertile plateaus in summer and, when winter encroaches, trail their flocks down to sea level. Theirs is a hard life with no amenities and only family, animals and mountains (and the occasional bear) for company.”, says Suzanne Swan in this article as she explores an ancient way of life she has come to know during her research on Turkish cheese in Turkey. Apart from his wife, a mountain shepherd has one other vital soul mate. 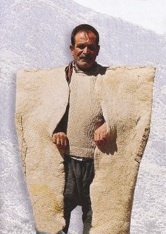 This is a special kind of cloak made from goat hair, known as a kepenek. It is bulky, lacks style or fashion appeal but is versatile enough to be worn as a raincoat, used as a pillow or becomes a snug coat. On a high altitude, starry-cold night, every shepherd cherishes this essential piece of kit.